At a glance, the 2014 Topps Baseball 1st Edition cards don't look very exciting. A parallel of sorts to the flagship 2014 Topps Baseball set, they're actually incredibly rare. 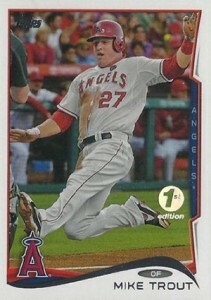 Shop for 2014 Topps Baseball 1st Edition cards on eBay. A prize in the Spring Training Access contest from 2014 Topps Series 1, just ten sets were produced. One was given to each of the collectors who found a Spring Training Access Pass, which were inserted randomly as box loaders. Sets come with 665 cards. This includes the full 660-card base set as well as five Rookie Variations found in retail factory sets. 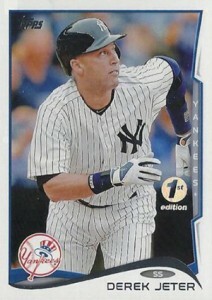 The set goes up to #661 but there is no #7, like the base set, as is retired in honor of Mickey Mantle. The box is essentially one of the blue boxed factory sets with a large 1st Edition logo added to it. The 2014 Topps 1st Edition cards aren't flashy. They're just like the base version of the card with the addition of a small foil logo on the front. The cards are not serial numbered. But their limited quantities, connection to the main set and different distribution all contribute to their appeal. And while ten sets were made, it's very possible that not all of the prizes were redeemed. While some of the sets may remain in tact in winners' collections, at least a few are getting broken down and sold off. Not surprisingly, some of the key cards have brought big returns. The first Derek Jeter on eBay sold for $399.99 while Mike Trout went for $300. Two different versions of the Masahiro Tanaka (regular card and retail variation) each sold for $249.99. Several star players and rookies went for anywhere from $50 to $200 early on. With all of the sets arriving at roughly the same time, it's likely that there will be a bit of a flurry of 2014 Topps Baseball 1st Edition cards available all at once. After that, they'll probably dry up and pop up very sporadically for a lot of players.